GreyGrey Designs: Super Hero Inspiration Board! Is it crazy that I am already planning a birthday in October? Not to me. Our close friends Michael and Meghan's son Grant is having his second birthday in October and Meg and I have already been brainstorming themes. So, I was cruising Etsy tonight and decided to do a little inspiration board! Super Hero TableScape: Setting the Mood (she does AMAZING work). I LOVE THIS!!! 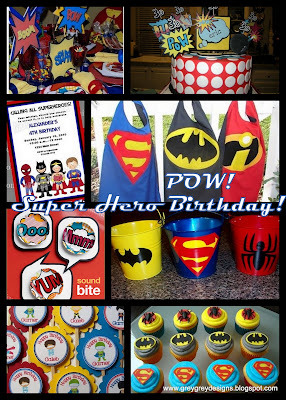 The cake, invitations, and capes are to die for! Ooh, I can't wait for October! Have I mentioned you're a creative genius? Can't wait for aaden 2nd birthday.! Those capes are a MUST HAVE. !